MONTY: "No, Doc! Say it ain't so! I can't be allergic ta Cheese! Monty: The cheese! It's gonna eat me! Karl - Winner of the this week's "Most Painful Caption To Even Think About" award. Monty: "Crikey, lads, she's gone round the bend! There's PIES EVERYWHERE!!" Monty: It's all my fault. Why did I let Zipper tag along with those Hell's Insects? Loneheart - Who are we going to pick on at Disney when Eisner's gone? Monty: "I've just seen Eisner Talking to two guys from Pest Control! EVERYBODY RUN!!" Monty: Ya' don't understand lads, If the European Union tightens rules on what is Brie, there will be a SHORTAGE OF BRIE! MONTY: Aaah, they're makin' a sequel to the Crocodile Hunter movie! wetskunk -Winner of the week's "Most Obvious Fact About Monty"
Monty: No boys, I can't go five minutes without cheese. 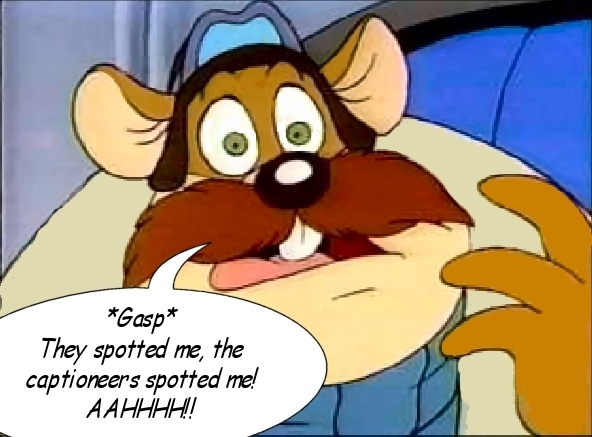 Monty: I can't believe Chip agreed to do a Rescue Rangers calender! He knows how bad I look in swim trunks! Monty: Crickey. I'm in Monty Python's Cheese Shop sketch!